Someone once told me that when you're a designer, your designs are like your children, and even though I don't have kids I have care deeply about my projects. Over the past three months I've been working on an expansion of one of the hotel's restaurants, which will see its first even this coming Staurday. The image above was before we started construction about 6 weeks ago. This rooms was built about six years ago and was a room surrounded by windows and wood shutter. Today, the room has no windows around it but the shutters remain and were refinished. I took this image yesterday while checking the job site. 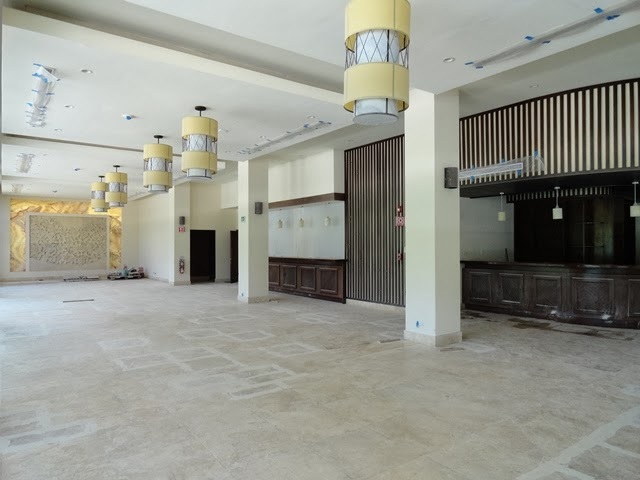 As you can see the lamps have changed, there's more light in the room, the wood strips in the wall are gone and there is a new stone accent wall where the show kitchen window used to be. Check out the progress of the project via Instagram @efournierm... You might find something you like! Hi dear, this sounds like such an exciting project, you are so talented at what you do, can't wait to see the full transformation! Fabulous! And yes! How you care for your project definitely shows. Thanks for sharing! The project looks and sounds amazing. Lots of light is one of the most important things to me.